For today’s life style we have expanded our homes living space to include the outdoors more than anytime in recent history. With treated exterior woods, composite trim, concrete siding and a multitude of concrete paver stones and retaining wall block designs and sizes our boundaries are limitless. Let us design an outdoor living space designed for you. 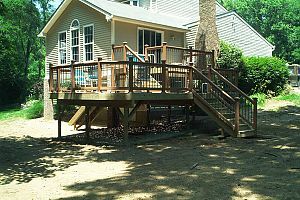 Whether it’s a new deck, stamped concrete patio or paver brick lounge area we can help. Maybe it is a covered patio, three season screen room or a retaining wall to turn that hillside into a level area for family gatherings. Let Bayes and Sons create an exterior living space for you. As part of the remodel, we can add gas grills, sitting areas and storage sheds so that you can enjoy the natural environment around your home to the fullest.